MADERA, CALIFORNIA (April 1, 2017) – Courtney Crone and Toni Breidinger both won Midget main events on Saturday night to give the young ladies a sweep of the feature events in Saturday night's Pombo/Sargent Classic at Madera Speedway. The race honored Al Pombo and Marshall Sargent, two of the all-time great racers in the history of California Super Modified racing primarily in the 1950s and 1960s. Both Crone and Breidinger have larger racing plans on their horizons, adding to the intrigue of the exciting night on the fastest one-third mile in the west. Crone will compete in the Formula Car Challenge Series in 2017 after winning a scholarship through World Speed Racing. 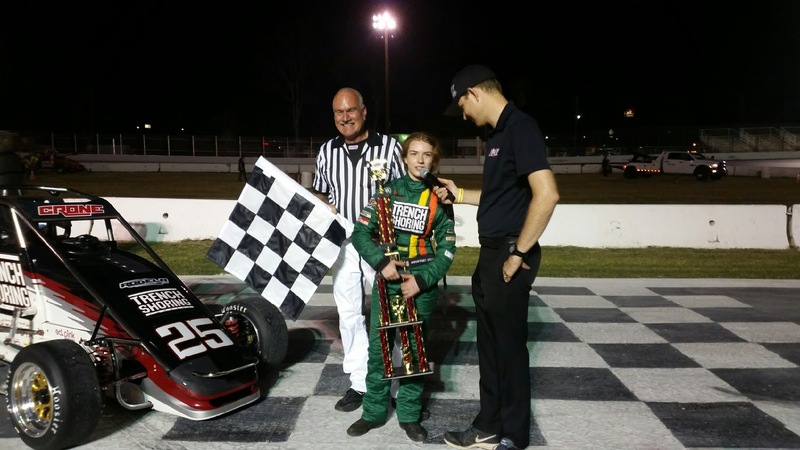 Breidinger aims to compete in select USAC Silver Crown races this year as well as the RPM Mortgage Pro Late Model Series at Madera Speedway televised on MAVTV. Napa's David Prickett started alongside Spanaway, Washington driver Shawn Breitsman for the start of the 30 lap BCRA Midget feature that capped the busy evening. Prickett led the opening lap while Crone charged forward in Jerome Rodela's #25 entry to run second by the third lap. Crone challenged Prickett for several laps before leading the sixth lap of the race. Fast-time qualifier Chad Nichols, 2016 BCRA Midget pavement champion, leapt up into third but spent several restarts trying to work his way past Prickett. All the while, Crone enjoyed open race track and ran the quickest lap of the weekend on lap 14 in the 13.5s. Nichols finally got around Prickett with ten to go but was unable to make up any ground on Crone. Crone bobbled slightly on lap 25 when she lit up the left front tire in turn three, but she settled down and ran four flawless laps to take a 1.177 second win. Goodwill, heat race winner Scott Pierovich, and Spanaway, Washington's Tony Seidelman rounded out the top-five. For Toni Breidinger, her USAC Western US Midgets victory extends her mark as the winningest female racer in USAC history. She set the mark March 18th when she won the division's pavement opener and is now two-for-two in 2017 on asphalt. 2017 51FIFTY Jr. Late Model Series season opener winner Jesse Love IV, age 12, is also the 2016 USAC overall champion. He led much of the early laps of the race with Breidinger hotly in pursuit. Breidinger, the 2016 USAC asphalt champion, was relentless in applying pressure including using her bumper several times to try to force the issue. Breidinger nearly made the pass at one stage in turn one but slid up the race in a slidejob type maneuver. Love was able to sail inside out of turn two and used a lapped car in turn three to hold onto the lead. 2016 Mini Cup champion Adam Lemke, 14 of Hollister, spun to bring out a caution and another caution flew on lap 24 when Tom Patterson tagged the turn one wall when he lost his brakes. Toni Breidinger took off with the lead and eventually ran the fastest lap of the event on the 30th and final lap for a 1.815 second victory with Love second ahead of the surging Annie Breidinger. Lemke worked his way back up to fourth ahead of Blake Brannon. In other action on Saturday night, Howard Holden is undefeated in Super Hobby Stocks as he won his second feature in that division in three weeks. Eric Humphries of Chowchilla added another victory at the speedway to his resume, this time in the CSS 360 Super Modified feature. Nearly 30 Legends of Kearney Bowl and BCRA Vintage Midgets wowed the crowd along with Anthony Pombo and Mike Sargent honoring their family legacy in Vintage Open Super Modifieds at breakneck speeds. Ripon's Denny Burell drove from last on the grid to win the NCMA Sprints feature as the series opened its 30th year of competition. He had a race long duel with fellow series veteran David Burchett of Tracy en route to the win. IRWINDALE, Calif. (March 25, 2017) - It was a clean night at Irwindale Event Center. And that's just how Todd Gilliland wanted it. Leading the field from pole, and hot off a win in the first NAPA Auto Parts Twin 100 feature, the 16-year-old from Sherrills Ford, North Carolina, held off a hard-charging Chris Eggleston to win for the third time in 2017 and 10th time in his NASCAR K&N Pro Series West career. The victory, his second at Irwindale, also awards him a $10,000 prize for finishing in the top-three spots in the four-race NAPA 500 Challenge Series. 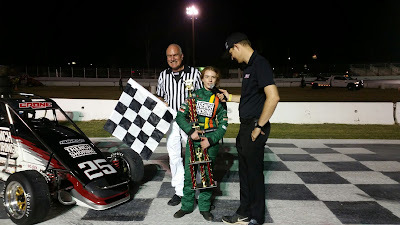 The NASCAR Next driver's win also marked Bill McAnally Racing's 14th victory at the California short-track. With only one caution in the opening 92 laps, it looked as though it would come easy to the reigning K&N Pro Series West champion. However, a spin from Takuma Koga set up a mad dash to the checkered with four laps to go. Eggleston, diving his No. 99 NAPA Filters Toyota into Turn 1, grabbed the race lead for the first time of the night from Gilliland... for about 40 feet. A swift over-under maneuver from Gilliland and his No. 16 NAPA Auto Parts Toyota quickly gave him the lead back by the time they reached Turn 3. Repeating the show with two laps to go, Eggleston was unable to make the move work for the win. A second-place finish marks the fourth straight top-five finish for the 28-year-old Erie, Colorado, native. Michael Self, 26, from Park City, Utah, was the only other man to win anything Saturday at Irwindale, as he took the top spot in final practice in his No. 9 Sunrise Ford/Eibach Springs/Lucas Oil Ford. In the race, Self grabbed a third-place finish followed by Derek Kraus and Will Rodgers, who earns a fourth straight top five, in fifth. Julia Landauer finished sixth with Garrett Archer, who rebounded from a start-line violation, Nicole Behar, Blaine Perkins and Todd Souza completing the top 10. The NAPA Auto Parts Twin 100s will air on NBCSN, Saturday, April 1 7p.m. ET/4 p.m. PT and 8 p.m. ET/5 p.m. PT. 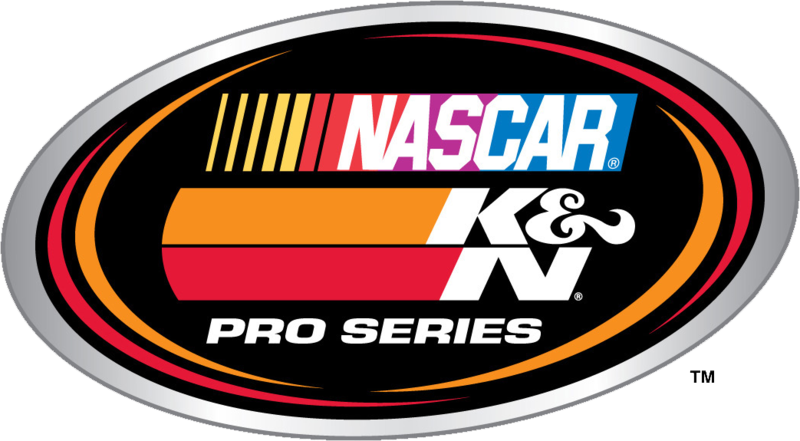 The NASCAR K&N Pro Series West will be back in action May 13 at Washington's Spokane County Raceway. 1. (1) Todd Gilliland, Sherrills Ford, N.C., Toyota, 100 laps, 80.754 mph. 2. (2) Chris Eggleston, Erie, Colo., Toyota, 100. 3. (7) Michael Self, Park City, UT, Ford, 100. 4. (6) Derek Kraus, Stratford, Wis., Toyota, 100. 5. (10) Will Rodgers, Solvang, Calif., Ford, 100. 6. (4) Julia Landauer, New York, N.Y., Ford, 100. 7. (5) Garret Archer, Maple Valley, Wash, Ford, 100. 8. (13) Nicole Behar, Spokane, WA, Toyota, 100. 9. (12) Blaine Perkins, Bakersfield, Calif., Chevrolet, 100. 10. (11) Todd Souza, Watsonville, Calif., Toyota, 100. 11. (9) Ron Norman, Tucson, Ariz., Chevrolet, 99. 12. (3) Matt Levin, Tucson, Ariz., Chevrolet, 99. 13. (8) Johnny Borneman, Ramona, CA, Ford, 99. 14. (14) Brandon Schilling, Sierra Vista, Ariz., Ford, 98. 15. (16) Kody Vanderwal, LaSalle, Colo, Ford, 98. 16. (15) Rich DeLong III, Santa Clarita, Calif., Chevrolet, 98. 17. (18) Bill Kann, Scottsdale, Ariz., Toyota, 97. 18. (17) Jesse Iwuji, Carrolton, Texas, Chevrolet, 97. 19. (19) Takuma Koga, Nagoya, Japan, Chevrolet, 95. 20. (20) Dan Phillippi, Los Angeles, Calif., Ford, 94. Lap Leaders: T. Gilliland 1-100. 5. G. Archer, 145; 6. T. Gilliland, 143; 7. B. Perkins, 141; 8. J. Landauer, 136; 9. K.
Vanderwal, 130; 10. M. Levin, 127. IRWINDALE, Calif. (March 25, 2017) - Todd Gilliland had them covered in the NAPA Auto Parts Twin 100 at Irwindale Speedway. Winning a third straight pole in his No. 16 NAPA Auto Parts Toyota, Gilliland swept the show with the race to win the first twin event of the night. The victory stands as the 16-year-old's ninth NASCAR K&N Pro Series career victory and the Sherrills Ford, North Carolina, native's second of 2017 and second at Irwindale overall. Finishing 2.4 seconds in rears of the defending champion, Chris Eggleston put up a fight in his No. 99 NAPA Filters Toyota. Taking the lead on Lap 50, Eggleston lost the top spot to Gilliland with 33 laps to go. Still, the Tucson winner grabbed his fourth straight top-five finish with a second-place finish. Garrett Archer came home third while Nicole Behar, who started from the rear, rallied back to finish fourth. The 19-year-old was followed by Will Rodgers, Solvang, California, native earned a third straight top-five finish in fifth. The 100-lapper wasn't as easy for some competitors, however. Derek Kraus, who finished second to teammate Gilliland last time out at California's Kern County Raceway Park, cut a tire and crashed on Lap 17. The 15-year-old, Wisconsin, native finished 18th, nine laps down. Jesse Iwuji retired due to engine failure while a two-car crash on Lap 58 collected Dan O'Donnell and Stafford Smith. Rookie Kody Vanderwal also spun in Turn 2, suffering no damage. Michael Self, who won practice, finished sixth with Blaine Perkins, Johnny Borneman III, Matt Levin and Julia Landauer completing the top 10. The NAPA Twin 100 will air on NBCSN Saturday, April 1 at 7 p.m. ET/4 p.m. PT. The NASCAR K&N Pro Series West will be back in action March 25, 2017 at 9:30 p.m. PT for the NAPA Auto Parts T-100, the second feature event of the night at Irwindale Event Center. 1. (1) Todd Gilliland, Sherrills Ford, N.C., Toyota, 100 laps, 72.845 mph. 3. (5) Garret Archer, Maple Valley, Wash, Ford, 100. 4. (21) Nicole Behar, Spokane, WA, Toyota, 100. 5. (8) Will Rodgers, Solvang, Calif., Ford, 100. 6. (3) Michael Self, Park City, UT, Ford, 100. 7. (11) Blaine Perkins, Bakersfield, Calif., Chevrolet, 100. 8. (10) Johnny Borneman, Ramona, CA, Ford, 100. 9. (7) Matt Levin, Tucson, Ariz., Chevrolet, 100. 10. (4) Julia Landauer, New York, N.Y., Ford, 100. 11. (12) Todd Souza, Watsonville, Calif., Toyota, 99. 12. (9) Ron Norman, Tucson, Ariz., Chevrolet, 99. 13. (14) Bill Kann, Scottsdale, Ariz., Toyota, 99. 14. (19) Kody Vanderwal, LaSalle, Colo, Ford, 98. 15. (15) Rich DeLong III, Santa Clarita, Calif., Chevrolet, 98. 16. (16) Takuma Koga, Nagoya, Japan, Chevrolet, 97. 17. (17) Dan Phillippi, Los Angeles, Calif., Ford, 94. 18. (6) Derek Kraus, Stratford, Wis., Toyota, 91. 19. (18) Stafford Smith, Eagle, Idaho., Ford, 58, accident. 20. (13) Dan O'Donnell, Oak Hills, Calif., Ford, 57, accident. 21. (20) Jesse Iwuji, Carrolton, Texas, Chevrolet, 25, engine. Caution Flags: 3 for 20 laps. Lap Leaders: T. Gilliland 1-49; C. Eggleston 50-67; T. Gilliland 68-100. 5. D. Kraus, 106; 6. B. Perkins, 106; 7. K. Vanderwal, 101; 8. J. Landauer, 98; 9. T.
Gilliland, 95; 10. M. Levin, 95.